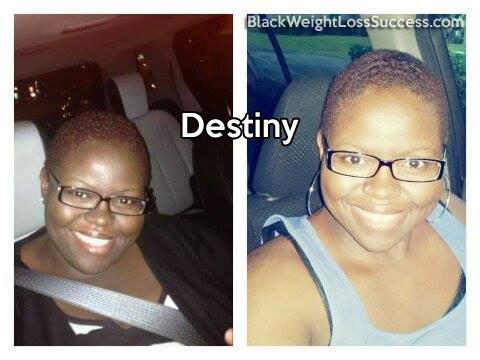 Weight Loss Story: Destiny lost 65 pounds. After a wake up call from her doctor, she was very motivated to avoid diabetes and potentially having to take insulin shots. 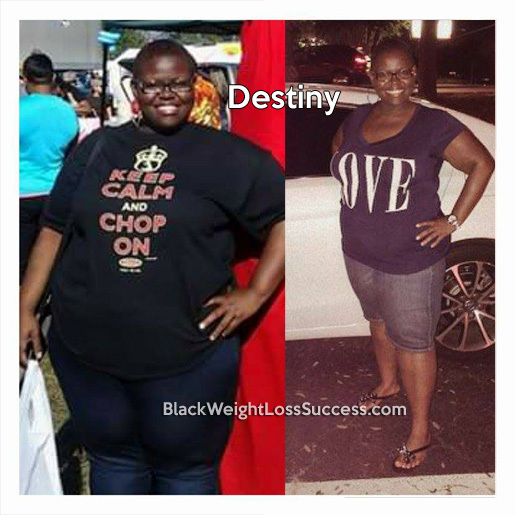 She wrote to us to share her journey and let us know what actions she took to release the pounds. The moment that I decided to take control over my life was when my doctor told me in March of this year that I was at risk for diabetes. I was scared and all I knew was that I did not want to give myself shots, nor did I want to take medicine. Now, I’m 5’2″ tall and weigh 257 pounds. I started out weighing 322 pounds. It took a total of 7 months for me to lose 65 pounds. Eventually, I want to lose 100 more. Then I will be at my goal of 157 pounds. What did I do? : I made major changes with regard to what I eat. Now, I only eat fish, chicken, seafood and lots of veggies. I cut out a lot of sweets, pasta, rice, bread, and red meat. I work out 5 days a week for one hour. In terms of exercises, I mainly do 30 minutes of cardio and 30 minutes of strength training. My best advice to anyone wanting to lose weight is to take baby steps and set realistic goals that can actually be accomplished.